Doesn’t matter where it is or what we’re going for, as long as there’s going to be spare time while we’re there, my preoccupation will always be to find the finest local restaurant. My wife really wants to go to the Edinburgh Festival one day; The Kitchin’s already planned. My family visit a relative on the Isle of Wight every year; The Hambrough is on the agenda for the next time I go along. I simply can’t help it, it’s just the way my mind works. When some friends of mine announced they’d be getting married near Belfast, I began searching for the city’s best restaurant before I even got the Save the Date. The place I eventually settled on was Deanes, which is probably the most famous restaurant in Northern Ireland, having held a Michelin star from 1997-2010*. With a convenient location in the centre of Belfast, it seemed the natural choice for the four-day visit. The first thing you notice about Deanes – and this hits you as soon as you walk in the door – is the atmosphere. This isn’t some temple of gastronomy with a congregation of food pilgrims silently worshipping every dish that emerges from the blessed kitchen. Nor is it a cold, expense-account-fest, filled with uninterested businessmen trying to show off to their clients. It doesn’t feel as if you’re trespassing at an elite club either; a dining room where if you weren’t public schooled and your credit card’s not platinum, you’d get snooty looks from patrons and waiters alike. Instead, Deanes is a place of celebration, packed full of ordinary locals simply looking to have a good time. It’s informal and lively and you can’t help but get infected with how vibrant it is. Out of all the Michelin and would-be Michelin-starred places I’ve eaten at – and there’s been a few – this was definitely the first where I was certain I’d have a fun evening before my bum touched its seat. Alas, the second and third things I noticed weren’t quite as positive. Service, while well-meaning, was a little on the chaotic side. One of our main waiters was excellent (hence the decent score below) but the rest were scatty at best. From being asked three times if we’d like to order after we’d already ordered, through requesting the sommelier who never arrived, and having to ask for the bill more than once (and then, after a ten-minute wait, having to ask for someone to let us pay it) it was a bit of a patience tester. And I was disappointed to find that a couple of fine dining’s more conventional trappings were missing. There was no amuse-bouche. Bread had to be paid for. £4.50 bought a decent but not particularly interesting board; I would’ve expected better for free. Petits fours seemed stingy too, not that we got any as we chose to drink brandy instead of coffee. The two tiny macarons I saw make their way over to one table barely seemed worth the effort. But these were relatively minor quibbles in the context of an otherwise great meal. It’s the dishes you order which matter the most after all – and, for the most part, they absolutely delivered. 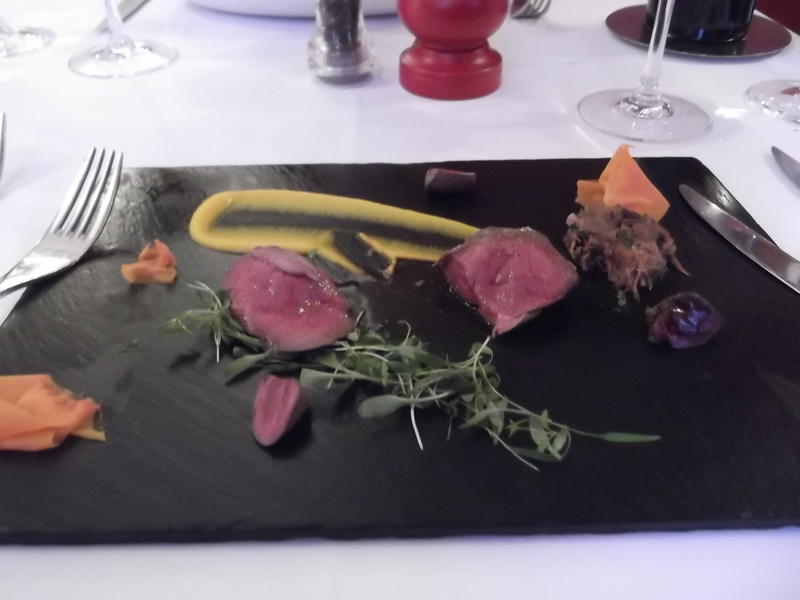 My starter was a celebration of squab pigeon, flawlessly cooked: two succulent and tender breasts served with a delicately flaked leg confit and gory chunks of kidney and liver. The plating was precise, as were the flavours and textures; each mouthful highlighting the quality of the ingredients and the skill and knowledge of the kitchen which created and cooked it. It was easily one-star Michelin standard – there was nothing to fault. My wife’s scallops with chorizo dish was almost as good. The scallops, while small, were still of stunning quality, fresh and sweet and singing of spring. I’ve never got on very well with chorizo but this was nice too, a more subtle flavour than I’m used to and a perfect accompaniment for the shellfish. 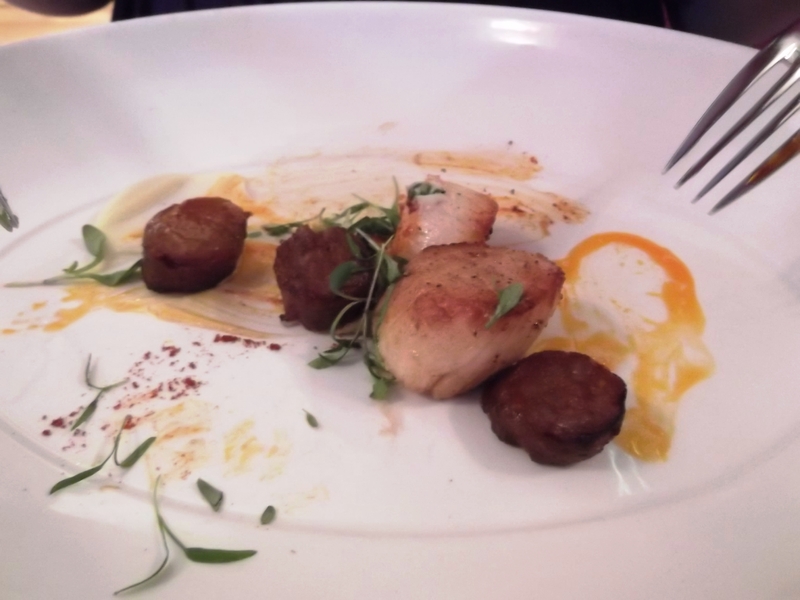 The only complaint was there could’ve been another scallop – at this size, two seemed a rather measly portion, and given the relatively large amount of chorizo on the plate, the dish was a little unbalanced. Both of us were sucked in by the day’s meat special: a 14 oz rib steak with chimichurri and triple-cooked chips. While I regretted not ordering a main that could better showcase the talent of the kitchen, it was still a very strong dish; a substantial piece of high-quality beef, well-cooked with a dazzling Argentinean sauce, full of spice and zing***. I did get a little bit bored with it halfway through and I think it would’ve been better served with the chimichurri on the side so I could mix up the flavours a bit, but it was still one of the best steak dishes I’ve ever had. The Rioja Viña Bujanda 2008, Crianza that was recommended by one of the waiters provided a worthy match. I had a difficult time choosing dessert, mostly because none of the options sounded that appealing, but I eventually settled on a chocolate pudding with rhubarb several-ways. 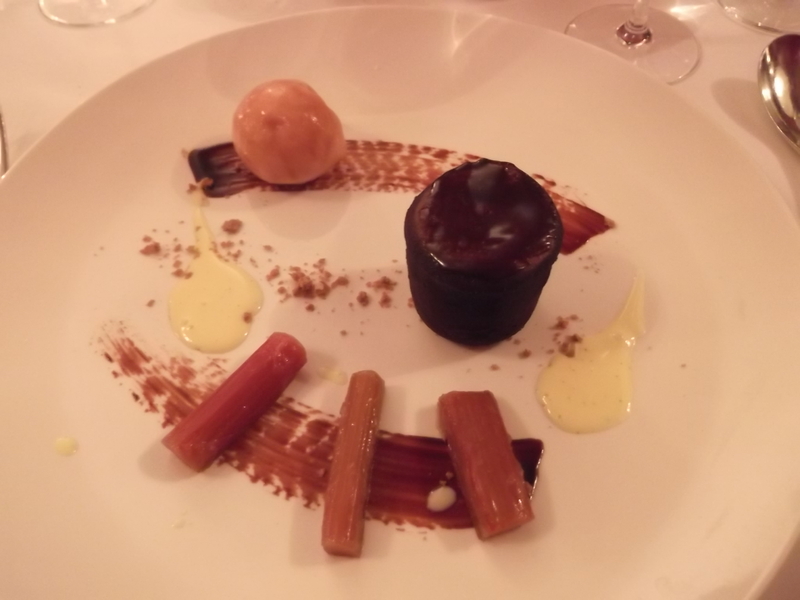 I don’t think rhubarb and chocolate go particularly well together but this was a fair bash at making it work, helped along by a really first-rate chocolate fondant. The recommended sauternes (we weren’t told specifically what this was and I don’t recall seeing it on the menu) seemed a rather lazy wine match but it went down nicely anyway, and actually ended up outclassing the food, which lacked some of the harmony and confidence I’d expect from a Michelin-standard sweet. It was a beautiful drink in a beautiful glass. We rounded off the meal in fine style with shorts of Rémy Martin XO**** and left feeling generally happy with the overall experience. 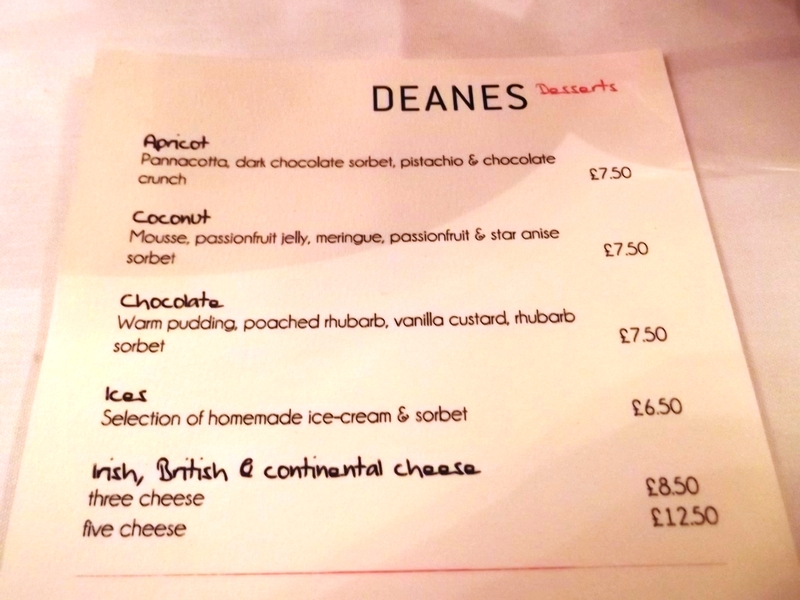 Deanes is not a restaurant I’d make a special journey for, and at £100 a head it was hardly a bargain. However, if I lived in Belfast I’d definitely go back, and if every meal was like this, I’m sure it’d become a firm favourite. Does it deserve to win its Michelin star back? That’s hard to say. The starters were definitely up to scratch, but the dessert wasn’t and it’s difficult to judge a steak on that sort of scale. If pushed, I’d say it certainly has the potential to win a star again. But my hunch is it’s not quite there yet. *The loss of Deanes’s Michelin star in the 2011 guide was blamed on a flood, which forced the restaurant to close down for four months during a time when inspectors were likely to have been doing their rounds. However, it is notable that Deanes failed to regain the star when the 2012 guide came out. **Apologies for both the starter images – I forgot to take a pic until after we’d started eating. ***Another issue with the service was how the dishes were described – in great and enthusiastic detail by the good waiter or in sparse, confused mumblings by everyone else. The steak in particular could’ve done with more information. The chimichurri was very spicy, which I liked but I know would be too much for a lot of people. A throwaway comment about it being “a sort of salsa” did little to make it clear what it is, how hot it was or how prominent it would be on the plate. There are few places in Manchester’s centre that are as charming as Sam’s Chop House, a haven of Victoriana in a 21st century city. The below-street-level timbered bar, with its olde-worlde fittings and characterful warmth, is as good a room to drink in as any in town. The dining area – a tiled jewel every bit as pretty as the centuries-old Paris bistros tourists go so wild for on holiday – is even better, and for years it had food to match. I vividly remember my first visit in 2005, when I was left awed by an incredibly simple but immaculate plate of smoked salmon, seasoned only with capers, egg and spring onion. An award-winning roast dinner followed: generous slices of stunning beef, gravy made from the pan juices, one crisp giant of a Yorkshire pudding, beautifully cooked buttery veg and that ultimate restaurant rarity – acceptable roast potatoes. I went back time and time again for the roast when I lived in the city centre. The portions were monstrous but I’d order other courses when I felt manly enough. There was the legendary brown onion soup, cooked for three days ‘til rich and sumptuous, and deeper than a poem by Sylvia Plath. There was the house-made corn-beef hash, a luxurious take on the tinned working class favourite; comforting and tasty enough to be a serious contender for a death row last meal. It wasn’t entirely consistent, but the fabulous surroundings and wine list were always the perfect plaster for any cracks. Sam’s was, quite simply, the best place to eat lunch in Manchester. Last week, after a two-year hiatus*, I decided it was finally time to go back. The usual crowd was in for a quiet Tuesday lunchtime. A few City-types enjoying business lunch over a bottle; an old retired couple trying admirably to conquer a full three courses. Not wishing to spend too much money or be full to bursting, we elected to just have two courses and drink beer. My hanger steak carpaccio had decent flavour and went well with a watercress, radish and horseradish coleslaw, but it felt more like sandwich filling than a complete dish. Certainly, it would’ve been more interesting between two thick slices of white bread, and I probably wouldn’t have felt so cheated by the portion size. My wife’s starter of scallops with ham hock and a butternut squash purée was better but similarly uninspired. The purée was sickly sweet and the scallops, though well-cooked, were dismally small. The combination of hot scallops with fridge-cold ham hock and lukewarm butternut squash was slightly disconcerting. One disappointment I experienced on an earlier visit to Sam’s was a dish of belly pork that was absolutely delicious but didn’t have any crackling with it, which sort of defeats the point of pork belly as far as I’m concerned. Seeing crackling specifically mentioned on the menu this time, I couldn’t resist giving it another go, and I found myself disappointed all over again. The skin itself was fine, though nothing more than that; the pork was very dry. Stodgy black pudding mash and somewhat out-of-place slices of mustard swede completed the dish. In a lot of pubs this would be adequate fare, but not in Sam’s, a place that one critic once said did “cooking like your mother wished she could”. I can’t imagine many keen home cooks being proud of this. The best bit of the meal was probably the chips served with my wife’s steak, although in a world where the triple-cooked variety is becoming increasingly common, they’re nothing to write home about. The steak seemed to be a lovely piece of beef, but of course in this meal of letdowns it was unevenly cooked; one half the requested medium, the rest more or less well done. It wasn’t a patch on the steak I remember ordering from here back in the day. The bill came to £66, which included three-and-a-half pints of Stella Artois and a 10% service charge. This seemed rather expensive given the quality of the food and compared to what we’d be able to get for the same price elsewhere in the city (a far better meal at The Mark Addy, for example). It was by no means a terrible experience, but it was thoroughly average. In the past, when I went to Sam’s Chop House, there was always a bit of magic about the place. If something wasn’t right, there was normally something else to make up for it; at the very least, there was the feeling that next time it would all be right again. Regretfully, on this visit, the magic was gone. Unless it’s just for a drink, I don’t think I’ll be going back. *In case you’re scratching your head and wondering why I stopped going if I loved it so much, I had to cut back a lot on restaurant visits between 2009 and 2011 as I saved up to buy a house and pay for a wedding. It’s only been open season again since August and now I don’t live in the city centre, lunch at Sam’s is no longer as convenient as it used to be. The last time I went to the Manchester institution that is The Lime Tree in West Didsbury, I missed Noel’s House Party. Needless to say, it was a while ago. The only things I remember about that meal are a beautiful beef carpaccio – my first experience of blue meat, and probably still the best – and a very cramped dining room. Despite a smart facelift at some point during the last dozen years, the latter hasn’t changed much. My wife, who is only 5ft tall, managed to clatter a menu off the table adjacent to ours while taking off her coat, much to the bemusement of the man trying to read it. If you’ve got a penchant for swinging cats while you eat, this is not the place for you. The dining tables are also on the small side, presumably so you don’t risk giving neighbouring diners a faceful of bottom when you go to sit down. Ours was overcrowded before the menus were placed upon it. Once a bottle of wine and a jug of water joined the affray and food started to be doled out, it bordered on pure chaos. But these proved to be only mild distractions in the grand scheme of things. As soon as a friendly member of staff had furnished me with an appealing menu and wine list, and the warm atmosphere had begun to charm, all was forgiven. Before I’d tasted a morsel, I was already thinking it would be a nice restaurant to visit with family or friends. It’s that sort of place. Fortunately, the food did little to stop me thinking that a future trip would be a good idea. 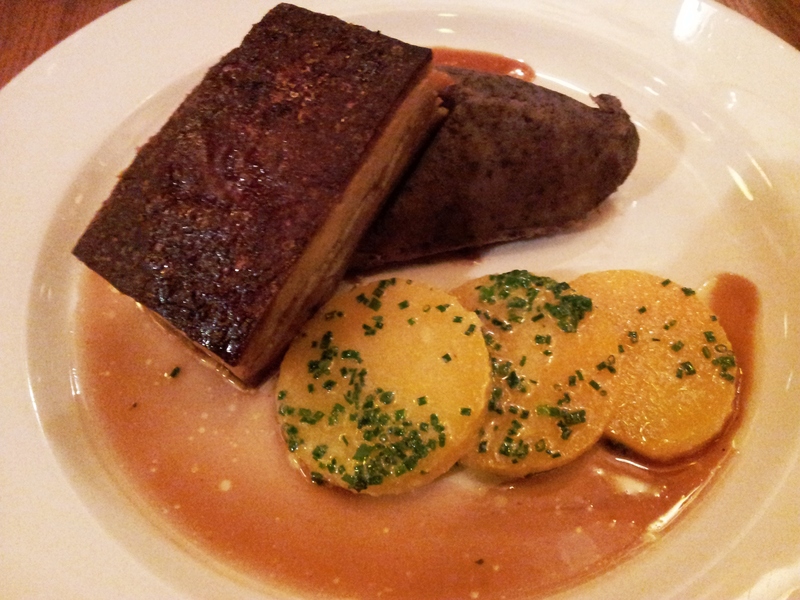 My starter of pigeon, black pudding, belly pork and apple was excellent. * When I reviewed Jem&I in East Didsbury a few months ago, I said some of its starters reminded me of the dishes that get rejected from the first round of MasterChef. But The Lime Tree gave me a dish straight out of the final; one that would be vomit-inducingly gushed over by John and Gregg. Annoyingly, my main didn’t come close to the same standard, and I mostly blame myself. Unable to decide what to order, my wife suggested I ignore the other items on the menu and get a steak instead. Stupidly, I listened and broke my golden rule. 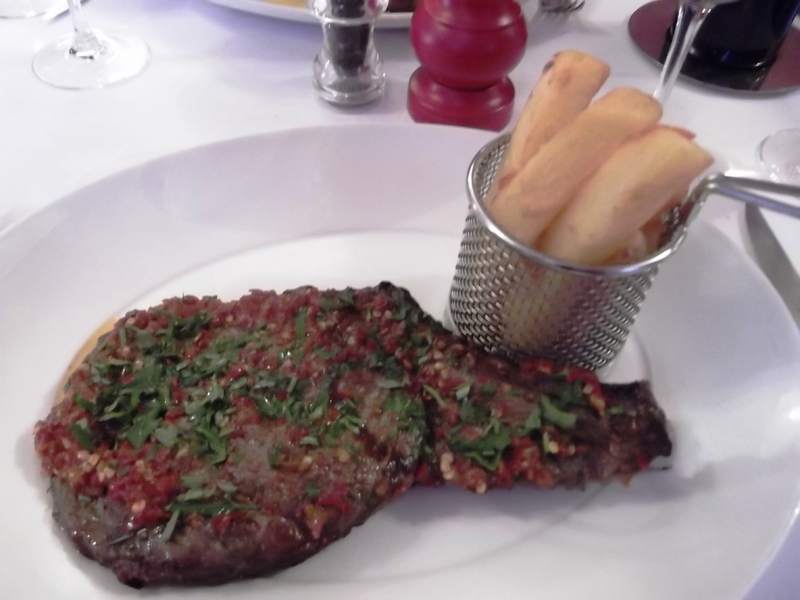 Never order a steak in a restaurant that doesn’t specialise in steak. The chips were perfectly fine and I had no quarrel with the mushrooms. It was also a nice healthy size, which isn’t always the case. But the T-bone itself was just sad. There was some flavour there; I could tell it was a good bit of meat. However, it had been cooked at too low a temperature and for too long. The outside was a pallid grey colour; the inside ranged from medium to medium-well (nothing like the medium-rare I’d requested). A good pepper sauce might’ve saved it, but this was probably the most disappointing part of the plate. Almost sickly in its creaminess, it lacked any degree of peppery bite. The meal got back on track with pudding. Crème brûlée – one of my all-time favourites – was done very well: the cream the right temperature; the glazed sugar the right thickness. Kirsch-soaked cherries, a decent sable biscuit and a few blobs of sauce on the side added a little bit extra. It was a satisfying way to round off the evening. The Lime Tree has an impressive-looking wall packed with all the accolades it has received over the years. But unlike some restaurants, they don't beat you over the head with it. It's tucked discreetly out of the way and you only really come across it when you go to the toilet. Given that my main was so weak, this probably sounds a little strange, but I strongly recommend The Lime Tree, certainly if you live in this end of south Manchester. Prices are comparable to the likes of Jem&I and No.4 Dine and Wine, but barring the one slip, the food was of a much higher standard, the ambiance was vastly superior and the wine list was a cut above. I’ve often found with local restaurants, once they’ve been around for a few years and they’re established enough that their customer base is assured, they’ll rest on their laurels a bit, treading out the same tired dishes over and over again. It’s to the credit of The Lime Tree that well over two decades since it first opened its doors, there is little sign of this being the case. For my money, it’s the best restaurant in Didsbury, east or west. Just stay away from the steak. *Interestingly, while I’ve been warned plenty of times over years that the dish I’ve ordered ‘may contain shot’, this pigeon was the first time I’ve ever come across some. One tiny little ball bearing, which I was tempted to keep, until I dropped it on the floor and promptly lost it. 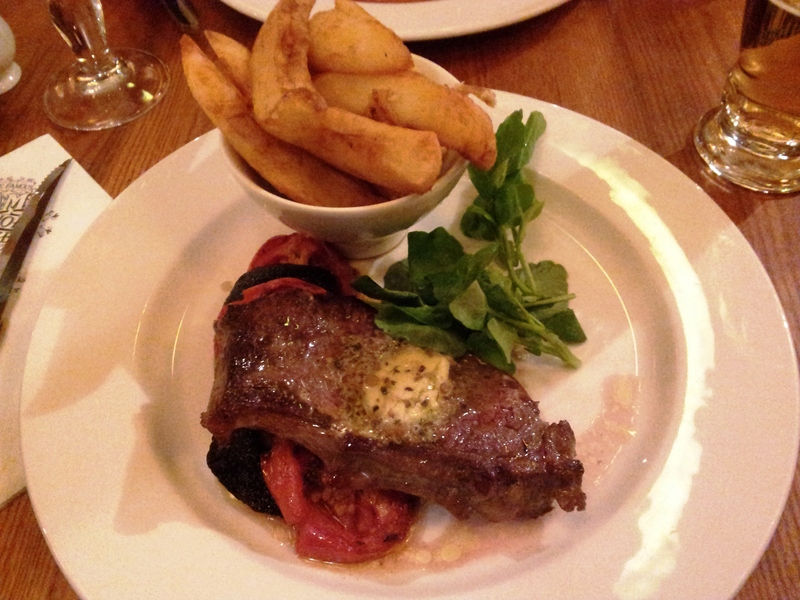 **£25 could buy you a steak at Smoak. Think it through. Beef Rossini (aka Tournedos Rossini), invented by king of chefs and chef of kings Auguste Escoffier* in tribute to the famous composer, conjured up all these feelings and more when I first read about it towards the end of last year and immediately went on my list of Foods To Try Before You Die. How could it not when the basic recipe consists of pan-fried fillet steak, a slice of whole foie gras, a crouton, black truffle and a Madeira demi-glace sauce? I’ve harped on before about how much I love beef, but what I haven’t touched on is how scared I am of ordering it in restaurants these days – or at least how scared I am of ordering it in restaurants that don’t specialise in dead cow. I’m genuinely frightened of it being a disappointment. Beef is my favourite food in the whole wide world and if anything short of stunning arrives on my plate, I’m going to wish that I ordered something else instead. The menu (interior). 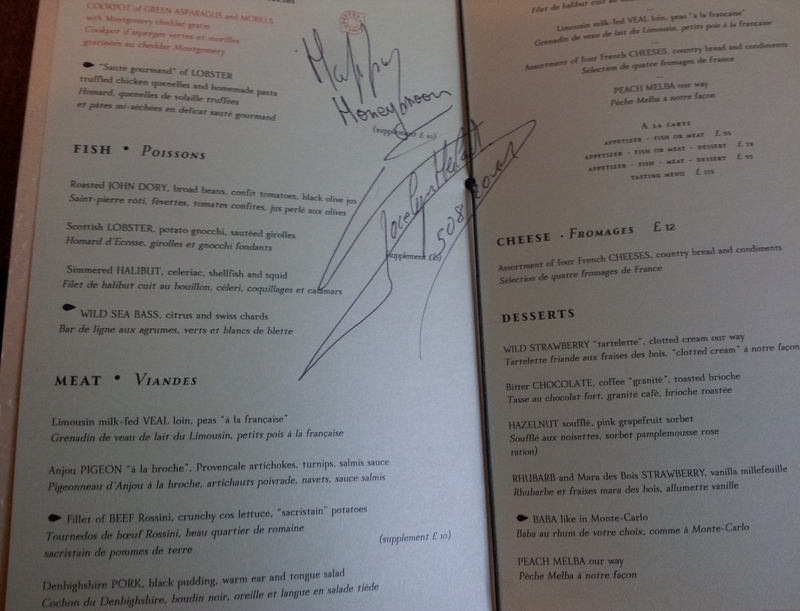 Our waiter arranged for chef Jocelyn Herland to sign it for us. The version they serve at Alain Ducasse is slightly different from what I’ve described above. Instead of a crouton, there was a thick piece of toast. The truffles and Madeira demi-glace were combined in a Périgueux sauce. Crunchy cos lettuce drizzled with vinaigrette, which you’d imagine was just a side, was a fundamental part of the dish. And it was all so perfect; I couldn’t imagine it being done any other way. The beef and the foie gras and the truffle sauce just belonged together, offering an exquisite marriage of richness and corruption that you only tend to find among Premier League football club owners. The toast soaked up all the flavours beautifully and added some extra texture to the plate. The freshness and acidity of the dressed lettuce cut through the richness like a guillotine in 1793; its vibrant green helping my eyes to survive the onslaught of brown. Combined, it tasted like the greatest burger you could possibly imagine. It was absolutely brilliant. The kitchen obviously deserves a lot of credit for cooking it all so precisely, and the amendments to the traditional dish (lettuce, toast) were masterful. The delightful sacristain potatoes that accompanied – peppery, spiral crisps that take a staggering amount of work to produce – iced the proverbial cake with further texture and flavours. But the real kudos should be reserved for the inventor of beef Rossini – whoever that may be. My overriding feeling, as I pushed knife and fork into the centre of the plate*** and waited for one of the excellent waiting staff to take it away, was that I’d just eaten one of the world’s great dishes. A recipe conceived by a genius – one that if you stay faithful to it, will deliver time and time again. I’ve had much better beef than the fillet steak I had here. I’ve had better foie gras too. 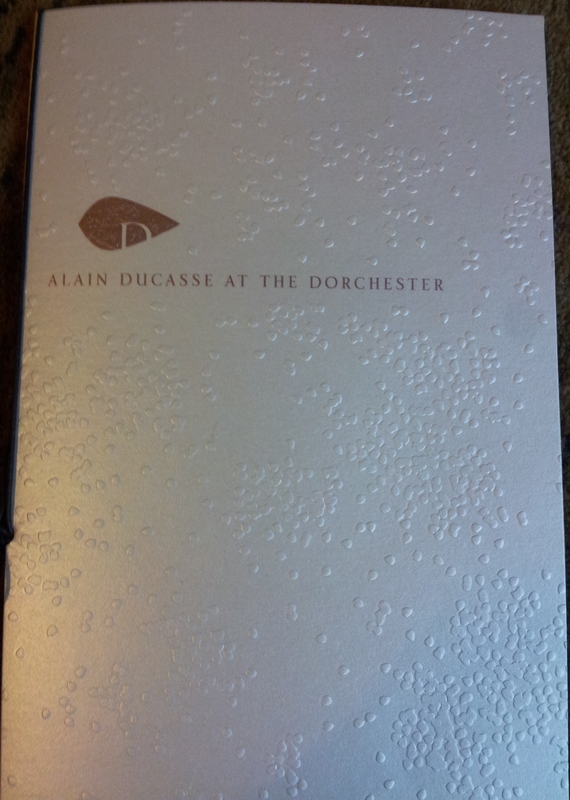 In fact, I had superior versions of both ingredients mere days before my trip to Alain Ducasse. But I’ve yet to have a whole dish involving either beef or foie gras that was anywhere near as good as this beef Rossini. To be honest, I might not have eaten anything as good in my whole life. *This seems to be the most common belief anyway. I’ve seen it said that Escoffier’s roi de cuisiniers et cuisinier des rois forebear Antoine Carême actually came up with it – either way, beef Rossini is a dish with serious pedigree. **I was also thinking that if I can’t trust a three-star Michelin restaurant to get beef right, I might as well just give up eating the stuff altogether. ***I loved the plate, by the way. It looked very plain, but there was a really subtle, almost imperceptible, decline towards the centre, which pooled the sauce and saved me having to chase it around the plate with the other ingredients. Just one of those little details that makes you realise the amount of thought and effort a restaurant like this puts in to trying to give you a perfect dining experience. 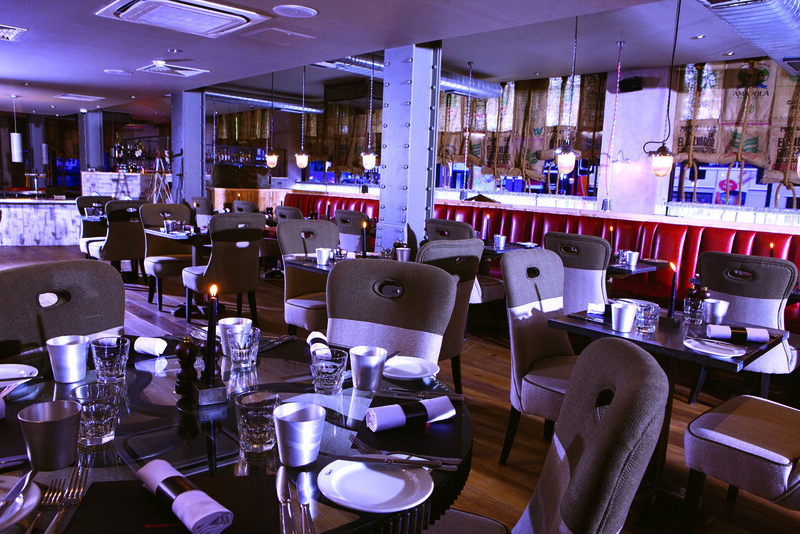 The best steak restaurant in Manchester has been Gaucho for years. But now there’s a new sheriff in town. Smoak is a restaurant that tries much too hard. Everywhere you look its desperation to be ice cool glares back. From the rustic lanterns that hang over some of the tables – and cause great irritation every time you have to duck around them when standing up or sitting down – to the ghastly metal-finished oil cans and sacks used as decoration, and the groan-inducing plumbed-in buckets that act as urinals in the gents, it’s a place that makes you want to roll your eyes like a teenage girl whose dad has just told her friends he’s a Lady Gaga fan. I’m trying to imagine how drunk they were at the design meeting where it was agreed that having metal beakers for water is a good idea. Presumably it was at the same meeting where they decided they were going to put the dessert menus on the back of the placemats and the staff should all wear t-shirts. Of course, I shouldn’t neglect to mention the glass butchery in the middle of the room, with its dead cow parts hanging from hooks. I’m by no means adverse to steakhouses showing off their produce in this way, but like most things at Smoak, it just feels false. As if the person who came up with it wasn’t thinking “let’s allow our customers to see our meat raw and up close, they’ll appreciate that”, but more “think how cutting edge we’ll look if we have a glass cage stuffed full of carcasses”. It’s a wonder that the meat is actually real, given how staged it is. I was slightly surprised not to see a wagon wheel in there alongside a cardboard cutout of Clint Eastwood. The over-the-top design continues into the food. Half a dozen oysters* were served in a ludicrously oversized bucket, with so much crushed ice in it I half expected to find a pre-transplant organ inside. The bone holding the marrow that accompanied the steak was so large you could beat someone to death with it – and I had half a mind to as I struggled to eat around it on the plate. But at the end of the day, I’d much rather go to a restaurant that’s desperate to impress than one that doesn’t try at all, and where Smoak gets it right, it gets it very right indeed. Take the dining room. Despite my quibbles above, it’s a very pleasant place to eat. Bright, airy, smart, it’s a world away from the gloomy, vomit-inducing garishness of Gaucho, which looks like Laurence Llewelyn-Bowen was asked to design a brothel for cowboys. And the steak is good. Very, very, very good. I suspect Smoak’s ownership of a Josper Grill might have more to do with it being the kitchen gadget du jour than a desire to grill meat to perfection, but it doesn’t change the end product. My bone-in sirloin was flawlessly cooked: a textbook medium rare with a char on the outside to die for – the kind you only ever really get from a Josper. The Belted Galloway beef was of fine quality too. Not at the same level as the meat I had at Goodman in London this summer, but easily as good as anything I’ve ever had in Manchester. With precise cooking and seasoning, and the Rolls Royce of grills at his disposal, the chef rang every ounce of flavour out of it he could, and the result was a steak that was truly sublime. Better than any I’ve had in this city; better than almost every other steak I’ve had. The rest of the food was perfectly serviceable: the chips were solid, there was nothing wrong with the mushroom, the bone marrow was nice, despite its unwieldy presentation. And the winelist was surprisingly friendly, offering a decent choice under £25 where I’d been expecting to find one or two wines at best. But for me, anything beyond the steak at Smoak is pretty much irrelevant. It makes up for all the restaurant’s deficiencies with aplomb, and anything else that’s good about the place is merely a welcome bonus. I think this change of opinion from my wife sums it up best. Before the meal, as it took us 30 minutes to get a drink at the incompetently staffed bar, she told me that she hated it already and wanted to leave. She spent the entire first course moaning and picking fault with the place; savaging it far more than I have in parts here. And then three bites into her steak, after groaning with pleasure and uttering the words “oh my god”, she asked if it could become our new special restaurant – the place where we go to treat ourselves on birthdays and other occasions. The beef had wiped all the negatives away and left her eager to come back. I’ve enjoyed going to Gaucho in recent years. I even went on my stag do and had a fantastic meal, perhaps the best yet out of five or six visits. In a lot of ways, it still sets the standard for this type of restaurant in my home city. But I can’t see myself going back anytime soon. 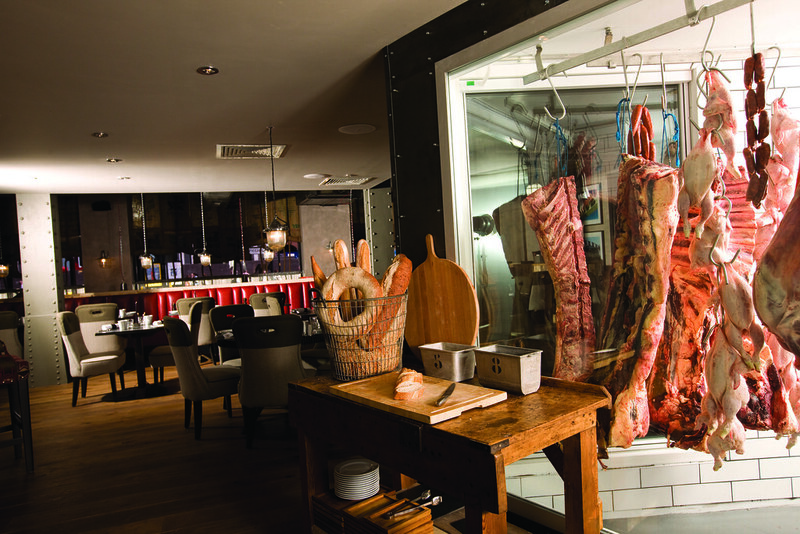 Based on grilled meat alone, there’s a new best steakhouse in Manchester. And its name is Smoak. Note: I returned to Smoak in June 2012 and had another good experience, although not as good as first time around. I’ve revised the score down on my Restaurant Ratings page accordingly. If you plan to go it’s worth looking around online for any discount offers as they seem to run these quite regularly. We had a 50% off food voucher on the latest visit, allowing us to share an excellent 900g wing rib sirloin (click link for picture) for the bargain price of £26. Steak and chips is my all-time favourite meal. I probably eat it once a fortnight as a minimum. Nothing fancy, just a big slab of medium-rare meat, chips fresh from the fryer and a side of sautéed mushrooms. If it’s a special occasion, like my birthday, I’ll probably triple-cook the chips and do a béarnaise sauce with it. But that’s about it. I like it nice and simple, with little in the way of distractions from the beef itself. Until I started to develop a keen interest in food about six or seven years ago, I ordered steak pretty much everywhere I went. However, because I didn’t go to many places of real quality, the choice tended to be limited to just three cuts: rump, sirloin and fillet. If I was lucky, there might be a rib-eye I could choose instead, but they never had the one cut I really wanted. The one that always seemed to be in films. The one with the cool name. The one they called… T-bone. Unfortunately, a couple of days later, I had to take it off The List. I remembered that I had actually eaten a T-bone, five years earlier at a random pub in York. It was a rubbish experience – owing to poor quality beef and shoddy cooking – but one that clearly meant it was disqualified. Goodman Steak Restaurants in London are meant to be among the country’s best steakhouses, if not the best. 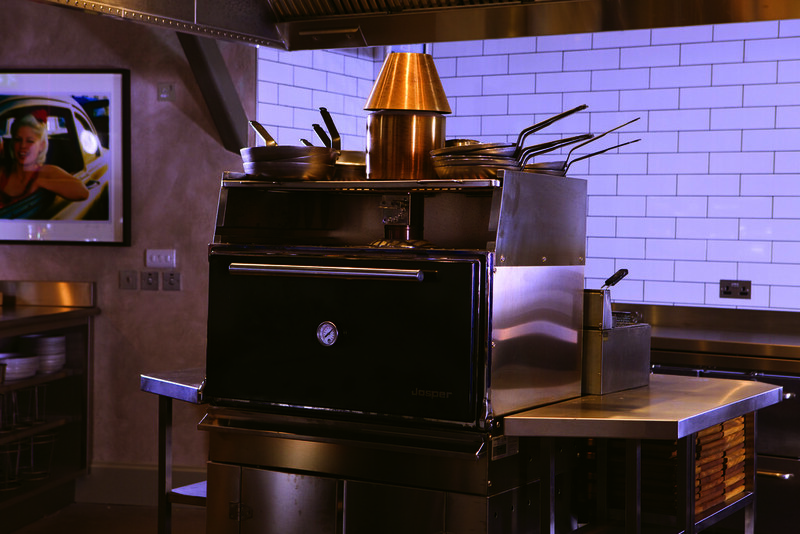 They offer extremely high quality USDA beef, as well as British varieties, and cook it all on a Josper Grill, the Rolls Royce of charcoal ovens. 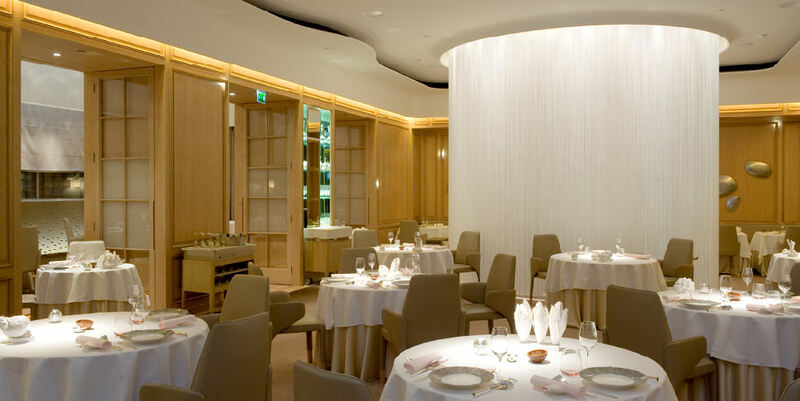 Andy Hayler, the food critic famous for having eaten at all of the world’s three-star Michelin restaurants, raved about the steak he had at the branch on Maddox Street in Mayfair. What better place could I visit to give the porterhouse a spin? My wife and I went to Goodman (the one on the purple bit of the Monopoly board) on the third day of our honeymoon. I was immediately impressed by the huge, wooden-handled shank that was placed before me on the table instead of the usual steak knife. Any restaurant that gives me a weapon to carve up my beef clearly means business. I tried the rib-eye first and it was incredible. From field to plate, you could tell the love that had gone into it. It was a beautiful piece of beef, perfectly aged and perfectly cooked. The char on it was awesome; the taste mega. Stalin would go to bed at night dreaming he had the authority this flavour commanded. It was in a totally different league to the best steak I’ve had in the UK (at Gaucho) and even topped the best I’ve ever had, at Ben & Jacks Steakhouse in New York. Nevertheless, it couldn’t hold a candle to the porterhouse, at least as far as my tastebuds are concerned. It was clearly of the same standard, but I found myself preferring the milder, cleaner and much more defined flavour of the top loin. It was like putting a Humvee up against an Aston Martin – I can appreciate the big, hulking juggernaut, but I’m going to choose James Bond’s car every time. Still, even an Aston Martin seems a bit lame next to a Bugatti Veyron, and so the top loin did here. The tenderloin wasn’t just in another league, it was on another planet. Whoever it was who said fillet steak doesn’t have any flavour needs to be hunted down and beaten to death with a top tier porterhouse. Andy Hayler said he’s had superior beef at a couple of places, but I can’t imagine how this could be bettered. It just sang. I had beef Rossini at Alain Ducasse a few nights later. Afterwards I concluded that it was probably the best dish I’d ever had, but the fillet of beef itself couldn’t compare to the tenderloin at Goodman. It went beyond wizard; it was full-on Jedi. And as a Star Wars geek, my praise doesn’t really get any higher than that. Verdict: Highest possible recommendation, but with the caveat that you try it somewhere really good. It doesn’t matter how great the cut is, if the beef’s not of a high quality or it hasn’t been aged well or cooked properly, you won’t have a special experience. *The tenderloin may not be substantial on a T-bone, but you’re still getting a bonus steak. It’s like going to a brothel and buying 60 minutes with an alright prostitute and then finding out you get 5 minutes with a really good one as part of the package. **The porterhouse is very closely related to the T-bone, with both cuts being taken from the short loin of the cow. So similar are they that apparently some butchers will label a porterhouse as a T-bone, in order to avoid confusing customers. The porterhouse is actually taken from the larger end of the short loin, so it comes with a much bigger portion of fillet. ***Sorry, that was a much longer introduction than expected. ****We didn’t intentionally go for exactly the same as Mr Hayler, but it seems we’ve got similar tastes where beef is concerned. I do very much enjoy a rib-eye steak and I was interested to see how it tasted cooked on the bone and how the porterhouse stacked up against it. As per usual, I said “no” to sauces – I wanted to taste the beef all on its own.